Dedicated and serious shooters are always looking for the better way to accomplish hitting a target, whether that is in the application of shooting (the accuracy and speed part) or an increase in power. Despite current trends, there are still many shooters who desire a cartridge that represents more power than just “good enough”, especially for a specific task or purpose. More power will always be more power, but this constant search can also lead to excesses in one direction or another. However, if we use this axiom of accuracy, power, and speed to measure a pistol itself, what results would we gather? 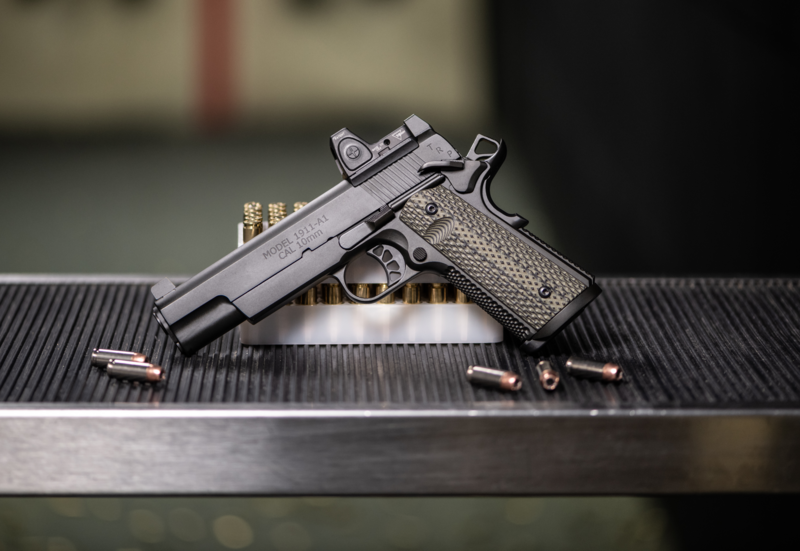 This new offering from Springfield Armory takes the existing TRP™ 10MM 6” and steps it up a bit. When compared to the original TRP™ 10MM, the addition of a Trijicon RMR® (Ruggedized Miniature Reflex) sight along with back-up tritium sights immediately stands out. Similar to the existing TRP™ 10MM 6″ this new pistol uses a stainless steel match-grade bull-barrel with fully supported chamber, as well as the long recoil spring plug that allows for the use of standard government-length recoil springs. No special long-slide recoil springs needed. However, what I think is the most notable change for this gun is the long, full-profile, heavy dust-cover on the frame, as it puts more weight low and forward on the pistol, but more on that later. So, applying the “accuracy, power, speed” maxim, how does Springfield’s TRP™ 10MM RMR® 6″ measure up? Let’s define accuracy in simple terms; it is the guns mechanical ability to repeatedly hit what it’s pointed at. While I am not normally a red-dot optic pistol shooter, the concept is not new or unfamiliar to me. The optic itself is not a defining aspect of accuracy for the gun, but it does allow for easy placement of projectiles on a target and easy “sight” acquisition, especially in dimly lit situations. The shoot-ability of this longer and heavier pistol allowed me to repeatedly swing the 6” plate on a steel “hostage” target at 50 yards. So is it acceptably accurate? I’d say so. It’s worth noting that a 6” 1911 will obviously have a longer sight radius as well, and while this is something that is useful for accurate shooting at distance, it is somewhat mitigated by the red-dot optic. Never the less, the back-up sights are there should they need to be used, so it’s worth mentioning the longer sight radius they employ. Without going into the historical attributes, concepts, and development of the 10mm cartridge, let’s just establish that it is, for an auto pistol cartridge, powerful. A current 180gr loading can be had as an FMJ traveling along at a nominal 1050fps or a JHP (often used for personal defense or hunting) making 1300fps. For those of you doing the math, that is a power factor of 189 and 234, respectively. There are of course many other loadings available and the longer 6” barrel may help increase some of these velocities. Combine that with the ease of use the RMR® provides and this configuration presents a pretty formidable hunting partner. Generally speaking, as the power of the cartridge increases with a greater performance level so typically will the recoil impulse. So as we once again approach the aforementioned balance, there comes a point where, in order to increase or maintain a given performance level, ones equipment must change. This is where the “speed” part comes in. As I mentioned earlier this new TRP™ 10MM RMR 6″ offering uses a 6” bull-barrel which, like the previous 6” TRP™, carries its weight forward helping to influence the felt recoil impulse of the pistol. Obviously adding to the lessened felt recoil is the longer (and heavier) slide, as it requires more energy to put the slide in motion. This generally translates to a softer recoil impulse felt by the shooter. However, what I find to be the most interesting aspect of the gun, and one that relates greatly to the “speed” element of shooting, is the long heavy dust-cover configuration. Putting the weight low and forward on the frame has always been one of the simplest ways to make a pistol move less while shooting. All things being equal, if you can make a frame heavier at this point it will essentially act as a counter balance to the recoil forces and motion of the slide. This feature, likely more than any other present on the gun, is the one I appreciate the most. My initial experience with the TRP™ 10MM was with a 5” Operator. I was lucky to get to shoot that gun a good bit…. like 400 or so rounds in the space of about 2.5 hours. While the Operator frame helps make the gun more shootable when compared to a standard dust-cover frame, the power of the 10MM cartridge still makes its presence known. When you add together the longer/heavier slide, 6” bull-barrel, and heavy dust-cover frame of the new TRP™ 10MM RMR® 6″, the recoil difference between it and a 5” gun is night and day. This configuration with the heavy dust cover and longer slide really shines and simply makes the gun over-all easier to shoot and certainly easier to shoot at speed. It should be no surprise that I am a 1911 devotee of the highest order. Even in its original format, long before gunsmiths were fine-tuning the platform, the gun has always seemed the ideal embodiment of accuracy, power, and speed. It’s likely what attracted me to the platform many years ago, before I had even heard a faint reference of that saying. And they are probably the reasons the platform in general remains a solid choice as a personal defense gun. While this particular 1911 configuration wouldn’t be my first choice for concealed carry, it provides an equalization of those three aspects with which one can apply the versatile power of the 10MM. Without anything more than an ammo change, this pistol can easily balance the duties of a range gun to a field gun – all with the comfort and familiarity the 1911 platform provides.